This unique network of hydrophones is a collaborative effort between OAR’s Pacific Marine Environmental Laboratory (PMEL), all NMFS Science Centers, the NOS National Marine Sanctuary System, and the National Park Service to establish and collect consistent and comparable long-term acoustic data sets covering all major regions of the U.S.
Click here for larger globe view. 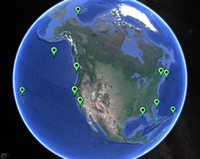 For a Google Earth view of the stations, open the kmz file here. Passive acoustic monitoring of the ocean ambient sound field is a critical aspect of NOAA’s mandate for ocean and coastal stewardship. This includes detecting and characterizing: (1) sounds produced and used by living marine resources (e.g., endangered marine mammals); (2) natural sources of noise from physical oceanographic processes; and (3) anthropogenic noise sources that contribute to the overall ocean noise environment. Noise generated by anthropogenic activities (especially commercial shipping and seismic oil & gas exploration) is increasingly being recognized as a potential threat to marine mammals which are protected in the U.S. by the Marine Mammal Protection Act and the Endangered Species Act. Current scientific data suggest that increased ambient noise levels impact marine mammals by hindering communication (Hatch et al. 2012), altering communication behavior (Parks et al. 2013), altering locomotive behavior (Pirotta et al. 2013), and inducing stress (Rolland et al. 2012). Additional concerns associated with the degraded acoustic quality of diverse habitats broaden these concerns to include possible repercussions for fish and invertebrate species, many of which NOAA manages as commercially-harvested, protects as resources within sanctuaries, or studies as key elements to sustaining healthy ecosystems. For these reasons it is important for science-based regulatory agencies including NOAA to monitor long-term trends and changes in the ambient sound field. It is of critical importance to continue these baseline measurements so we can establish as long a time series as possible to gauge the changes induced by anthropogenic and climate stressors on the marine ambient sound environment (for a summary see Hildebrand 2009). We will investigate the spatio-temporal variability in low-frequency deep ocean ambient sound levels (10 - 2,200 Hz) at these 12 ocean regions within the U.S. EEZ. Our ongoing goal is to maintain (and possibly expand) the array and build a multi-year record of ambient sound levels in these regions. We will then be able to identify and delineate seasonal and long-term man-made and climate-induced noise sources. Hatch, L.T., Clark, C.W., Van Parijs, S.M., Frankel, A.S., and Ponirakis D.W. (2012): Quantifying loss of acoustic communication space for right whales in and around a U.S. National Marine Sanctuary. Conservation Biology, 26:983-994. Hildebrand, J.A. (2009): Anthropogenic and natural sources of ambient noise in the ocean. Marine Ecology Progress Series, 395:5-20. McDonald, M.A., Hildebrand, J.A., and Wiggins, S. M. (2006): Increase in deep ocean ambient noise in the Northeast Pacific west of San Nicolas Island, California. Journal of the Acoustical Society of America, 1520:711-718. Porter, M., and Henderson, L. (2013): Global ocean soundscapes. Proceedings of Meetings on Acoustics, 19:010050 (6 pages). Parks, S.E., Johnson, M.P., Nowacek, D.P., and Tyack, P.L. (2012): Changes in Vocal Behavior of North Atlantic Right Whales in Increased Noise. In: The Effects of Noise on Aquatic Life, Popper, A.N., Hawkins, A. eds., Springer, pp. 317-320. Pirotta, E., Milor, R., Moretti, D., Di Marzio, N., Tyack, P.L., and Hastie, G. (2013): Vessel Noise Affects Beaked Whale Behavior: Results of a Dedicated Acoustic Response Study. PLoS ONE, 7(8):e42535. Rolland, R.M., Parks, S.E., Hunt, K.E., Castellote, M., Corkeron, P.J., Nowacek, D.P., Wasser, S.K., and Kraus, S.D. (2012): Evidence that ship noise increases stress in right whales. Proceedings of the Royal Society B., 279:2363-2368.